If you are thinking of redesigning your bedroom or just thinking of freshening it up, new bedroom furniture may be one of the things on the agenda. Your wardrobe is after all the main piece that will cost the most after your bed so some careful thought must be put in before you purchase. There are many different types of wardrobe from 4 door units to stylish wardrobes with sliding doors and many more. Of course, what type and style that you go for. We will discuss a few of these in this short post. First up is the standard stand up wardrobe which are quite large and common. These can take up a lot room and if you are limited on space you may want to look into another design, as the doors will open outwards. The good thing though is that you can store a lot in this type of wardrobe and you will have a minimum of a rail and a top shelf to store items that are folded up like jumpers and shirts. You can have a wardrobe with built in drawers at the bottom and this may result in you not having to invest in a separate chest of drawers. 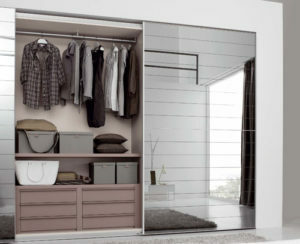 You can also have a sliding draw wardrobe that saves space by not having to open the door outwards. You can also add glass to these so the door doubles up as a mirror. Corner wardrobes are also available and if you have space in your room a walk in version could be an option. There is also a variety of materials that you have your new wardrobe from wood, plastic, and glass. It would be best to visit a showroom first before to see what the products look like close up. You should also take your room measurements also so the specialist will be able to advise you.